I picked up this old table from the curb side. I was an antique style kick leg table. It wasn't a real antique but I thought I could make it look like one. 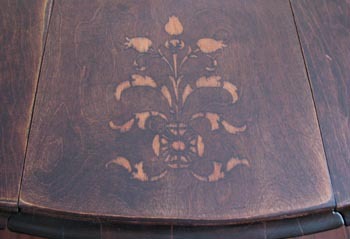 I found a great Early American Stencil Pattern that I liked and knew it would go well with the style of the table. After sanding down the table top and getting it ready for staining, I laid low-tack masking tape over the entire area that I wanted the stencil. Then I traced the stencil onto the tape and used a craft knife to cut along the lines. Don't worry about cutting too deep and scoring the wood below the tape because these lines in the wood will create a nice line with th stain and help you get cleaner lines on the stencil image. I lightly peeled away all of the tape except for the pieces of the stencil islands (or the openings in the stencil) so that when I spread the stain on the table these areas would be covered. I put my first layer of stain on the table and brushed straight over the taped areas. I used a dark stain called Dark Walnut and put a second coat on when the first was thoroughly dried. After the second coat was very well dry I peeled away the remaining tape and brushed on one layer of Natural Stain to let the real tone of the wood show through. After a light sanding I put a clear coat over the entire table top for a protective coating. Now I have a great extra table for when guests come over (especially for the holidays) and boy was it a fun project. I've stenciled with stain before, but nothing as complex as yours and without such good results. I plan on trying your technique next. I'm featuring this on my blog Tutorials and Patterns. Please stop by.